Where namespace_identifier represents the XML namespace; this is a token that InterSystems IRIS replaces with the actual namespace URI, as discussed in a later subsection. 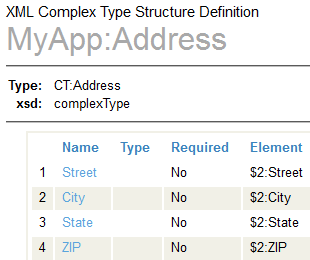 This token is needed only if the element or attribute is in a namespace, as you will see later in this chapter. When you load a schema into InterSystems IRIS, it establishes a set of tokens for the namespaces used in that schema, for use in any DOM-style paths. InterSystems IRIS assigns namespace tokens for all namespaces declared in the schema, whether or not those namespaces are actually used. Therefore, InterSystems IRIS might use $3 or a higher value rather than $2 for the items of interest to you, if additional namespaces are declared in the schema. It is practical to use the Management Portal to view the individual path units, as discussed in the next section, to be sure that you are using the correct token for a specific path unit. 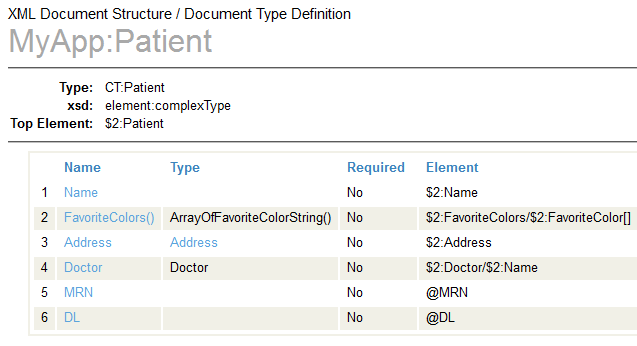 Select the Interoperability > Interoperate > XML > XML Schema Structures page. The left column lists XML schemas loaded into this namespace. 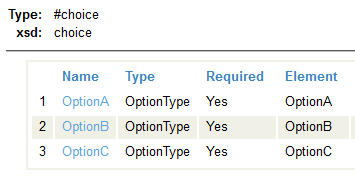 Select Category link in the row corresponding to the XML schema of interest. Select the link for the document type of interest. Similarly, if the schema has multiple elements at the same level but in different namespaces, then InterSystems IRIS appends _2, _3, and so on, as needed to create unique names at that level. This procedure applies only to the schema-dependent paths.